(CBS/AP) BOSTON - A former Navy SEAL from a Boston suburb was one of four Americans who died in the attack on the U.S. consulate in Libya Wednesday. 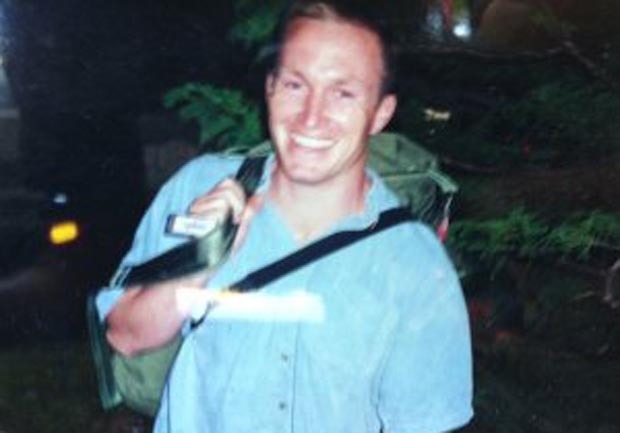 Forty-two-year-old Glen Doherty was killed with U.S. Ambassador Christopher Stevens in Benghazi, a family friend told CBS Boston on Thursday. "He was on security detail and he was protecting the ambassador and also helping the wounded"' when he was killed, his sister, Katie Quigly told the Boston Globe. Doherty was a 1988 graduate of Winchester High School. A third victim has been identified as Foreign Service Officer Sean Smith, an Air Force veteran who had worked as an information management officer for 10 years in posts such as Brussels, Baghdad and Pretoria. The identity of the fourth American killed is still not known. The four Americans were killed when a group of U.S. employees went to the consulate to try to evacuate staff as the building came under attack by a mob wielding guns and rocket propelled grenades. Stevens is the first U.S. ambassador to be killed in an attack since 1979, when Ambassador Adolph Dubs was killed in Afghanistan. On Thursday, a senior Libyan security official said the attack was an organized two-part operation by heavily armed militants that included a precisely timed raid on a supposedly secret safe house just as Libyan and U.S. security forces were arriving to rescue evacuated consulate staff. Wanis al-Sharef, eastern Libya's deputy interior minister, said Stevens and another American were killed in the consulate as plainclothes Libyan security were evacuating them to the safe house. The second assault targeted the safe house, killing two Americans and wounding nearly about 30 Libyans and Americans. Meanwhile the Obama administration has begun what appears to be a terrorist hunt in Libya, as evidence mounts that the attack was perpetrated by well-armed thugs and not an out-of-control crowd. CBS News correspondent David Martin reports the FBI has opened an investigation into the deaths, and agents will be sent to sift through the wreckage for evidence. They will be accompanied by a second team sent just for their protection. As part of the hunt for the attackers, officials say the U.S. will increase its surveillance over Libya, including the use of unmanned drones. In addition, the U.S. Navy is positioning two destroyers armed with cruise missiles off the coast of Libya. One destroyer, the USS Laboon, moved to a position off the coast Wednesday, and the USS McFaul is en route and should be stationed off the coast within days. Officials said the ships, which carry Tomahawk cruise missiles, do not have a specific mission. But they give commanders flexibility to respond to any mission ordered by the president. The investigation will focus on whether the assault on the U.S. Consulate in Libya was a planned terrorist strike to mark the anniversary of the Sept. 11, 2001, attacks and not a spontaneous mob enraged over an anti-Islam YouTube video. After the attack, an elite anti-terrorist unit of about 40 Marines was flown in to beef up security at the American embassy in the capital of Tripoli. Air Force transport planes flew the bodies of the dead Americans out, along with at least three who were injured and the rest of the approximately 25 diplomats assigned to the consulate. At the same time, the U.S. State Department urged all non-essential personnel to leave on commercial flights. Three Americans injured in the assault on the consulate in Benghazi were being treated Thursday at the U.S. military hospital in Landstuhl, Germany, near America's Ramstein Air Base, CBS News has learned. Wanis al-Sharef, a Libyan Interior Ministry official in Benghazi, said there had been threats that Islamic militants might try to take revenge for the death of al Qaeda's No. 2 commander Abu Yahya al-Libi, who was killed in a U.S. drone strike in Pakistan in June, and he said the U.S. consulate should have been better protected. Confirming al-Libi's death for the first time in a video posted online Monday, al Qaeda chief Ayman Al-Zawahri called on Muslims in al-Libi's native Libya to take revenge for his death. U.S. officials believe the militants were using the demonstration against the video as a cover to get into the consulate and then take as much revenge as they could on Americans, Martin reports. While the White House has been hesitant to call the attack planned, House Intelligence Committee Chairman Mike Rogers was not so ambiguous. "Absolutely it's a terrorist attack," Rogers told CBS News Capitol Hill producer Jill Jackson. "This was not done by the Libyan government. It was done by an external group we believe has at least extremist ties, maybe al Qaeda ties, and the style and the signature of the attack clearly would be something that we have seen before and would be in line with something al Qaeda would do." Obama on Libya attack: "Justice will be done"
The White House says President Obama called the presidents of Libya and Egypt Tuesday and urged them to continue working with the United States to ensure the safety of diplomatic personnel. Mr. Obama thanked Libyan President Mohamed Magariaf for his condolences over the deaths of Stevens and the three other State Department officers. The White House says the two leaders agreed to work together to bring the attackers to justice. During a second call, Egyptian President Mohammed Morsi promised Egypt "would honor its obligation to ensure the safety of American personnel," the White House said. Mr. Obama told Morsi that while "he rejects efforts to denigrate Islam ... there is never any justification for violence against innocents." In a White House appearance Tuesday, Mr. Obama said the U.S. would "work with the Libyan government to bring to justice" those who Stevens and three other Americans. White House press secretary Jay Carney said it was too early to judge whether the attack was planned. "I know that this is being investigated, and we're working with the Libyan government to investigate the incident. I would not want to speculate on that at this time," he said. Several Libyan security guards also were killed. Rogers, R-Mich., said U.S. intelligence had not yet determined who was responsible, but added, "Our list is narrowing." "When you see (such an attack), it wasn't some folks who had some guns in their garage and said let's shoot up the consulate," Rogers said. Analysts are working on several different scenarios based on intelligence that could lead to a motive for the attack. Some concern the possibility of targeting high-ranking officials, according to a law enforcement official briefed on the investigation. But none of the intelligence thus far has suggested terrorists would specifically target Stevens, said the official who also spoke on condition of anonymity because he was not authorized to speak publicly about the investigation. The attack in Libya, which came hours after a mob stormed the U.S. Embassy in Cairo and tore down the U.S. flag, was presumed to have been triggered by a movie, whose trailer has gone viral on YouTube, depicting the Islamic prophet Muhammad in disrespectful ways. In an extraordinary move, Gen. Martin Dempsey, the chairman of the Joint Chiefs of Staff, called anti-Islamic preacher Terry Jones and asked him to stop promoting the film. A spokeswoman said the church would not show the film Wednesday evening. "Make no mistake. Justice will be done," a somber Obama pledged at the White House, Secretary of State Hillary Rodham Clinton at his side. He ordered increased security at U.S. diplomatic missions overseas, particularly in Libya, and said he condemned "in the strongest possible terms the outrageous and shocking" attack. Clinton said she was particularly appalled that the attack took place in Benghazi, which the U.S. had helped liberate from dictator Muammar Qaddafi during the Arab Spring revolution in Libya last year. The aftermath of the two attacks also stirred the U.S. presidential campaign, where until Wednesday, foreign policy had taken a back seat to the struggling economy. The Republican nominee, Mitt Romney, criticized the administration for statements issued before and after the Cairo attacks that expressed sympathy for those insulted by the video. But he in turn was criticized for turning a tragedy too quickly into political fodder, and getting key details wrong. Obama told "60 Minutes" that Romney "seems to have a tendency to shoot first and aim later." Obama and Clinton made a rare joint visit to the State Department, where grieving colleagues of Stevens and the other three Americans killed in Benghazi gathered in a courtyard. The president also ordered U.S. flags to be flown at half-staff at government and military buildings and vessels around the world until sunset on Sept. 16. Flags had already been lowered in many places to commemorate the victims of the 9/11 attacks. Clinton denounced those who might kill over an insulting movie. "There is no justification for this," Clinton said. "None. Violence like this is no way to honor religion or faith and as long as there are those who would take innocent life in the name of God, the world will never know a true and lasting peace." Underscoring the administration's frustration, Clinton wondered aloud about the attack in Benghazi, which Qaddafi had once threatened to destroy. "This is not easy," she said. "Today, many Americans are asking, indeed I asked myself, how could this happen? How could this happen in a country we helped liberate, in a city we helped save from destruction? This question reflects just how complicated and, at times, just how confounding, the world can be." "But we must be clear-eyed in our grief," she said, saying the attack was carried out by a "small and savage group" not representative of the Libyan people. She noted that Libyan security guards had tried to fight off the attackers, had carried Stevens' body to the hospital and led other consulate employees to safety. Stevens, a 52-year-old career diplomat, was killed after he became separated from other American officials during the consulate attack. It's unclear when he died: He was taken by Libyans to a hospital, and his remains were delivered hours later to U.S. officials at the Benghazi airport. "The mission that drew Chris and Sean (Smith) and their colleagues to Libya is both noble and necessary, and we and the people of Libya honor their memory by carrying it forward," Clinton said. U.S. officials said some 50 Marines were being sent to Libya to reinforce security at U.S. diplomatic facilities. Stevens spoke Arabic and French and had already served two tours in Libya, including running the office in Benghazi during the revolt against Gadhafi. He was confirmed as ambassador to Libya by the Senate earlier this year.